New corn disease confirmed in U.S.
MANHATTAN, Kan. – A new disease, bacterial leaf streak, has made its way into corn crops throughout the heartland. It's so new to the United States that it is unclear whether it will pose a threat to this year's yields, according to Kansas State University plant pathologist Doug Jardine. The U.S. Department of Agriculture-Animal and Plant Health Inspection Service confirmed the presence of the new disease Aug. 26, 2016. According to its announcement, the bacteria that causes bacterial leaf streak disease isXanthomonas vasicola pv. vasculorum (Xvv). APHIS does not consider it to be of quarantine significance and will treat it as other bacterial diseases of corn such as Goss's bacterial blight, Jardine said. The disease is thought to have occurred on corn in South Africa, but it has been most notably associated with gumming disease of sugarcane. At this time, it is not known how it made its way to the United States or how long it has been here. It was first observed in samples submitted to the University of Nebraska-Lincoln Plant and Pest Diagnostic Clinic in 2014, but a lack of historical information and the appropriate diagnostic methods delayed its identification until APHIS positively identified the bacteria from a sample collected in Nebraska in August 2016. Following its initial confirmation, APHIS, working with state departments of agriculture and extension plant pathologists, began a survey of corn fields across the western Corn Belt. 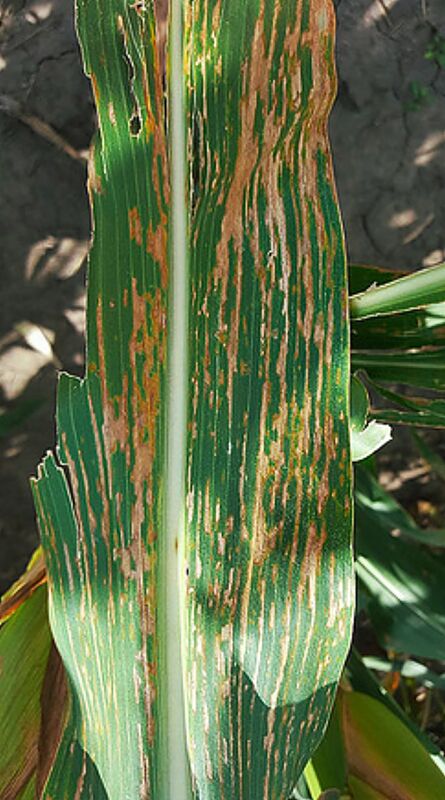 Bacterial leaf streak disease has now been identified in nine states including Nebraska, Kansas, Colorado, Iowa, Illinois, Minnesota, South Dakota, Texas and Oklahoma, Jardine said. "In Kansas, it has been positively identified in 12 counties, most of which are located on the High Plains," he said. "Three additional counties have had corn with symptoms of the disease, but samples have not yet been confirmed definitively by DNA analysis." Infected corn leaves exhibit narrow tan to brown streaks that range from less than an inch to several inches long. "To the untrained eye, the disease can look very similar to the common fungal foliar disease, gray leaf spot," Jardine said. "One diagnostic key is that bacterial leaf streak has narrow, wavy-edged lesions compared to gray leaf spot, which has very sharp, straight-edged lesions that follow the veins in the leaf. Sometimes the lesions occur close to the midrib; in other cases, they occur across the leaf blade." A second diagnostic key is that when backlit, light passes through bacterial streak lesions in a translucent manner compared to gray leaf spot, which blocks the light and appears opaque. Disease symptoms have been observed as early as growth stage V7 in corn, with lesions appearing on lower leaves first. Lesions can expand to cover larger areas and under favorable conditions, they spread to the upper leaves. In extreme cases, lesions may extend the entire length of the leaf and coalesce to form large, necrotic areas. It is not currently known how the disease has spread to so many states, Jardine said, but a current hypothesis is that it is seed transmitted. Movement within a field or from field to field may be by the bacteria blowing in the wind created by thunderstorms. Unlike Goss's blight, it does not appear that it needs a wound to aid it in getting into the plant. "Under what conditions is it likely to occur? By far the single largest scenario associated with the disease is corn being produced in a continuous, no-till, sprinkler-irrigated production system," Jardine said. "This is likely the reason that most positive counties in Kansas are in the western part of the state. That being said, the disease has also been found in furrow irrigated fields, as well as dryland fields in a strict corn-soybean rotation." No research has been conducted to date to determine if there will be any impact on yield, the K-State plant pathologist said. Disease management options are currently limited. Since it is a bacterial disease, fungicides are not effective. Because of the highly erodible nature of most Kansas soils, residue management will not likely be an option except perhaps in southeast Kansas. "We do not know how long the bacteria can reside in old crop debris, but observationally, it can survive through the rotational year to soybeans," Jardine said. "Observations in hybrid demonstration trials in Nebraska indicate that there are differences in hybrid response to the disease with some being much more susceptible than others. Long term, hybrid selection, as with Goss's blight, will be the primary means of management." As with any crop disease, he added, samples can be submitted to the K-State Plant Disease Diagnostic clinic through any county or district extension office or directly to the clinic. Information on sample submission can be found at tinyurl.com/hm9eale.